HMH Books for Young Readers, 9780544368439, 48pp. 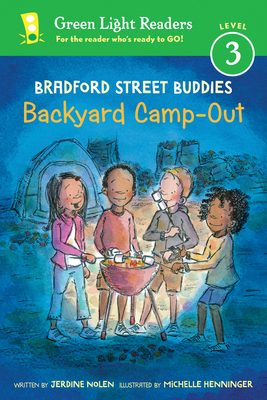 Will an unexpected visitor ruin the Bradford Street Buddies campout under the stars? Grab a flashlight and find out in this neighborhood adventure. "Short chapters, heavy on dialogue, emphasize the growing relationships among friends and family, and clear, emphatic statements suit this selection for beginning readers ready for a slightly more developed story line. This gentle narrative offers a few surprises and a delightful twist for newly independent readers." "A reachable challenge for those looking for a first chapter book...This friendly, multicultural neighborhood is where many children live...or wish they lived."